Edit: Airline issues a statement in response to this article. Response & necessary corrections/comments by The Flying Engineer may be seen towards the end of this analysis. The first quarter in the new financial year – Q1 2014-15 has come to a close. It is the first quarter to witness SpiceJet operate with an all new team and an almost all new image. The Flying Engineer takes a look back at the airline’s performance in 2013-14, and includes where necessary a five year study of trends to understand what could possibly have gone wrong in some areas at the airline. The piece also studies the changes being effected, and what little it may want to do to make the airline more appealing and profitable. FY2013-14 witnessed SpiceJet’s the lowest load factors. 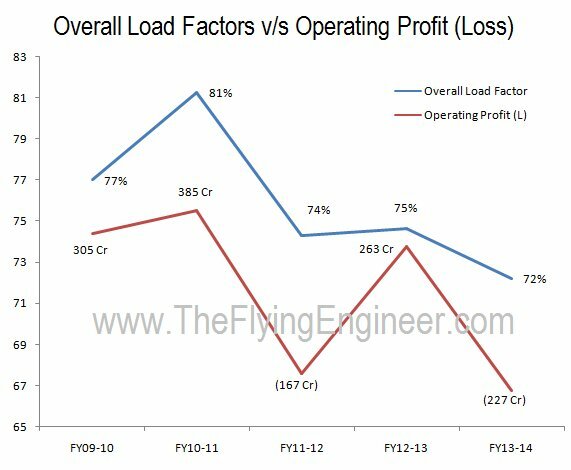 Strong relationship between load factors and operating profits. Load factors adversely impacted due to airline’s damaged brand. Load factors adversely impacted due to direct & connecting flights’ frequency and timings. SpiceJet loses traffic on certain important routes to IndiGo’s point-to-point network. Cargo on par with IndiGo, but lower than Go Air. 40 Minute turnaround and lowest aircraft utilisation among LCCs impacting revenue and costs. Dirty airplanes contributing to costs through increased fuel burn. Steep rise in maintenance cost possibly due to heavy maintenance checks. Dollar not a major factor in the sudden maintenance cost increase. Commission from sale of tickets adding cost to airline. Loan interest due to Q400 impacted by dollar. Newer 737NGs can save an airline significant costs. Q400 is a white elephant. Employees are an asset and a liability: game to be played carefully. Low Loads, Low Utilisation, Maintenance and Commission have largest impact. Verdict: SpiceJet could have been profitable, or at worst reported modest losses. Purely academic study shows SpiceJet could have reported 550Cr profit. SpiceJet is uniquely positioning its brand and product offering. Market dynamics will dictate if that will help it stay afloat. Airline hope to rope in more corporate travellers. Airline is paying attention to its staff, working towards infusing a feeling of inclusiveness and belonging. Airline is rationalising routes, restructuring its network, and stimulating demand. Load factors for the month of May and June are expected to be higher than that witnessed last year. Airline does not lose money on promo fares. 17% of SpiceJet’s Boeing capacity will compete with TATA-SIA, rest 83% with IndiGo and AirAsia. 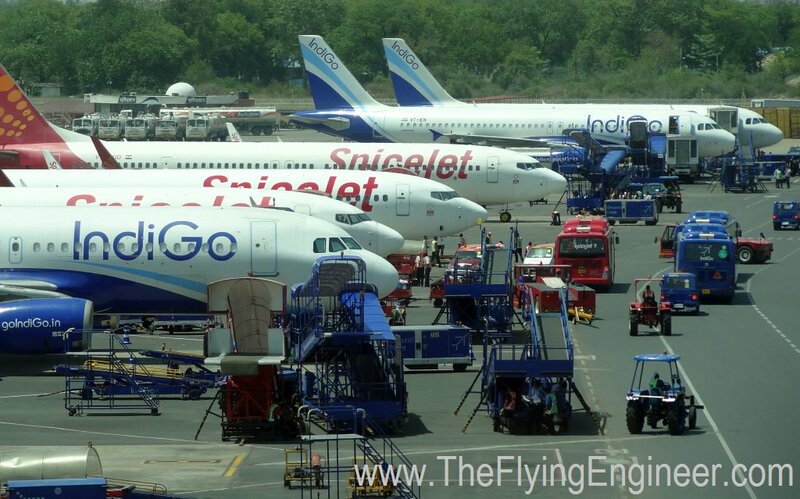 Today (June 30th 2014), only three airlines stand out as independent, low cost, pan-India airlines: IndiGo, SpiceJet, and Go Air, in descending order of their fleet size. Of these, IndiGo has been consistently profitable for six consecutive years, and Go Air has dipped in and out of profitability. SpiceJet, however, recently reported its largest ever loss of INR 1,003 Crore: a figure that is huge, and in sync with most other airlines. This raises an awkward question: are IndiGo and GoAir anomalies, or are all the other airlines at fault with their cost structure? October 2012 saw Kingfisher airlines ceasing operations, without having reported a single year of profit since its inception. Jet Airways and its low cost arm Jetlite have too much flab, and incidentally, are too old and too big to effect changes that can streamline the airline’s structures. SpiceJet is at a sweet spot: It is neither too big, nor too small. But SpiceJet has had a very rough past, considering the roots of the airline trace back to ModiLuft, which was the result of a technical agreement between the SK Modi group and Lufthansa. The airline, which began operations in 1994, ceased operations two years later due to disagreements, and later, the airline changed hands between promoters simply because the airline had a valid Air Operator Permit (AOP): a valuable asset considering the hassle involved in securing one. What was to become Royal Airways never took off, but that changed name to SpiceJet, and the airline changed hands in June 2010, with South India’s widely popular Sun Group’s Kalanithi Maran standing as the promoter till date. Those who know Kalanithi know him to be a man who induces fear: perform, or perish. In a sharp contrast to the overall great performance of his group’s assets, SpiceJet, which was to have been renamed Sun Airways, reported profits only in the financial year in which he took over the airline. Since then, the airline has unevenly reported losses, with FY2013-14’s being the largest. The year 2013, and importantly FY2013-2014, has been an interesting year for the airline. This is the first FY in which the airline has operated all fifteen of the Q400 turboprop airplanes the airline received from Bombardier of Canada. The particular aircraft has given the airline mixed results, with more disappointment than anything else. The same FY saw the airline losing its head- CEO Neil Mills. A constant movement in the airline’s management has proven costly, with each new person calling different shots that incur the costs of discarding an old strategy for something new. Further, the Sun Group did what most Indian businesses do: allowing friends and family with insufficient relevant experience or mindset to control the airline, leading to a downfall. To most non-family and top level employees, the freedom to perform to their best has been the single biggest problem, with insufficient oxygen to execute tasks. All that has changed with the appointment of Sanjiv Kapoor as the Chief Operating Officer in the November of 2013, who was promised a free hand to transform the airline. Sanjiv, who has been promoted by the board to the position of CEO of the airline, comes with background in legacy, full service carriers. 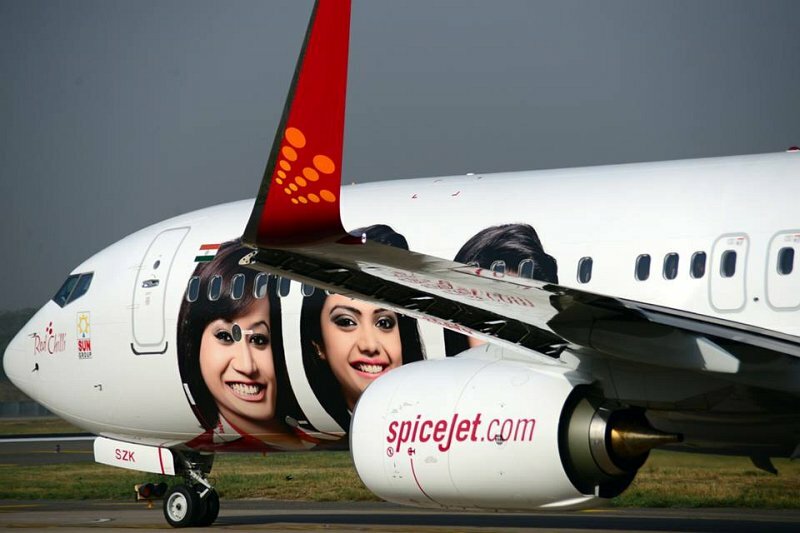 Flavours of that background are evident in the transforming SpiceJet, with the airline drifting from the image of a true low cost carrier to a premium carrier with low fares, whose target base is no longer the railway passenger but corporate. SpiceJet, which for long had the slogan “Flying for everyone”, is now proud to serve “With all our heart”, realising that catering to the masses is not its sweet cup of tea. SpiceJet’s transformation is better late than never. Many in the industry feel the airline is a sinking ship, and the arrival of AirAsia India will only serve as a catalyst. But with SpiceJet building a formidable team at the top, a strong determination to retract its unintended spoilers and focusing on its core assets-its employees, the airline may be poised stay afloat, and hopefully, jump the red into the green. SpiceJet reported a loss of INR1,003 Cr (INR 10,030 Million) during FY13-14. Over the last five years, the airline has twice reported a profit. Interestingly, one year prior to the acquisition of SpiceJet by the Sun Group, the airline reported a profit of INR 61 Crore, and when the airline was taken over in early FY2010-11, the profits tanked to INR 101 Crore. 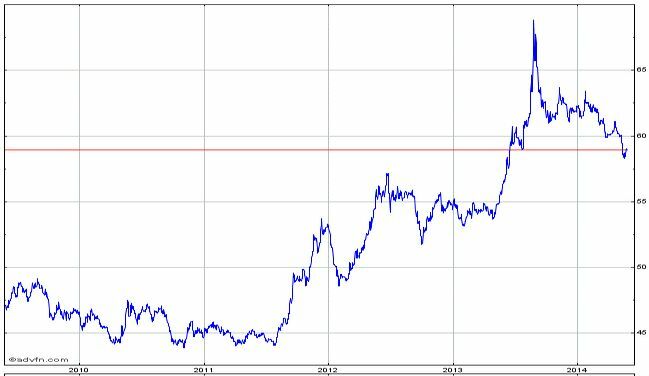 2010-2011 was an interesting period for the airline. After the acquisition in the July of 2010, the airline started flying international from October that year. A month later, the airline board approved the purchase of 15 Bombardier Q400 aircraft, with options for 15 more. The airline was all set to more than double its fleet, which stood at 20 aircraft at the end of FY2009-10. FY2011-12 and onward has seen the airline posting losses. The loss shrunk from 606Cr in FY11-12 to 191Cr in FY12-13, and then took a 5 fold slide to 1,003 Cr in FY13-14. Of the five years in question, although only two years reported a net profit, three years reported an operating profit. 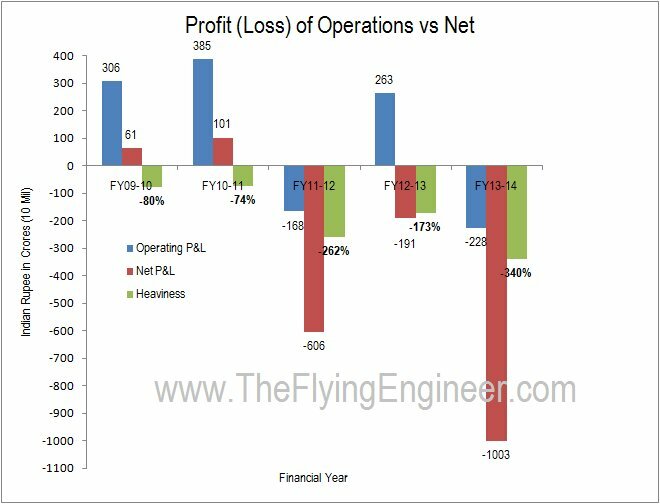 The Flying Engineer uses a term “heaviness” in the airline to describe other costs which pull down the profits linked to operations, which has the effect of reducing the net profit, and in three instances, is of sufficient magnitude to pull the airline into a net loss. Operating cost includes the cost due to salaries (of crew, engineers and all employees), fuel, lease, maintenance and spares, insurance, landing, navigation and airport charges, in-flight meals and beverages. Revenue from operations includes revenue from passengers, cargo, special service requests, sale of onboard food and beverages, and wet leases, when applicable. in FY13-14, the Net loss was 340% more (or 440% of) the operating loss. Finance costs, selling expenses, and “other expenses” have been huge, and responsible for adding to the net loss of the airline in FY13-14. An airline makes its money through operations. We study in this section those areas where revenue could have improved, and possible causes as to why they were not as high as they could have been. The first indicator of health, for a low cost & a low fare airline, is the load factor. The load factor is dictated by a variety of factors, which include overall airline appeal to passengers, route network, frequency and timing, and deployed route capacity. In the low cost carrier environment, one carrier cannot charge an airfare that is higher than the competition: there is no brand or service premium to justify the higher airfare, for the potential passenger (unless the airfare is bundled with other value added services). What carriers do, and what statistics has shown, is that the fares on the same route, for similar flight timings, are very similar. When competition intensifies, which is the case between IndiGo and SpiceJet, the fares are driven lower, and the only way to make up for low yields is through volumes: more of less is as good as less of more. When the overall load factors-the load factor considering domestic and international- are compared against the operating profit (or loss), a strong and obvious relationship emerges between load factors and operating profit. 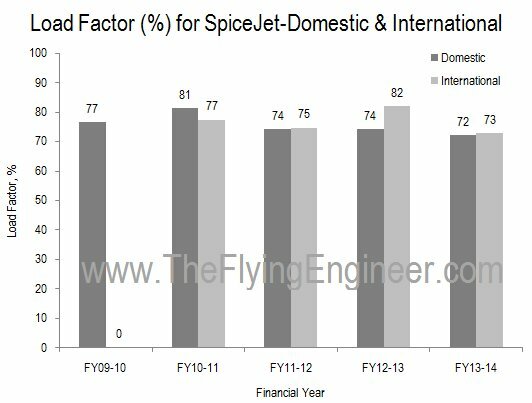 In the FY2013-14, SpiceJet had the lowest domestic load factors in the five year period, and also the lowest international load factors. That has had a visible effect on the operating profit and loss. The Flying Engineer examines some of the factors contributing to the airline’s low load factors, which is dependent on the passenger’s needs. The real focus for most passengers are just four simple things, in order of priority-timing & connections of the flight, the fare, the on time performance record, and the in-flight experience. For passengers, such as tourists and casual travellers who can exercise a flexibility in the time and perhaps the date of travel, the first two parameters get switched in their priority. With fares as much as the competition’s, it boils down to just the three factors. SpiceJet’s image had touched its lowest in Q1-Q2 of FY2013-14 on many counts: the in-flight experience, and on-time-performance (OTP). SpiceJet’s in flight experience was a reason for most to stay away from the airline, on grounds of aircraft cleanliness, service, and on board food. SpiceJet has a good number of older Boeing 737s, and the airplanes haven’t been kept in the best possible shape. Dirty seats, dirty interiors and exteriors can have a strong effect at the subconscious and conscious levels of a passenger when choosing a carrier for air travel. A dirty aircraft is also indicative of a poorly maintained aircraft, which is seen upon by the layman as an ill maintained aircraft. SpiceJet’s good safety record point to very good maintenance, but no passenger may be expected to look up the safety record to erase an ill impression about the airline. Simple things such as keeping the windows clean, seats clean, and parts of the cabin in place contribute to a positive customer experience, which has worked well in the case of IndiGo. Not once has its airplanes been found dirty or unappealing. The colors chosen also make a difference. IndiGo’s blue and white cabin is far more appealing than SpiceJet’s older airplanes’ grey, off-white, and dull red colors. Service was been criticized by corporate travellers and casual travellers alike, for their poor service in the last financial year. Corporate travellers contribute to a bulk of the airline’s revenue. 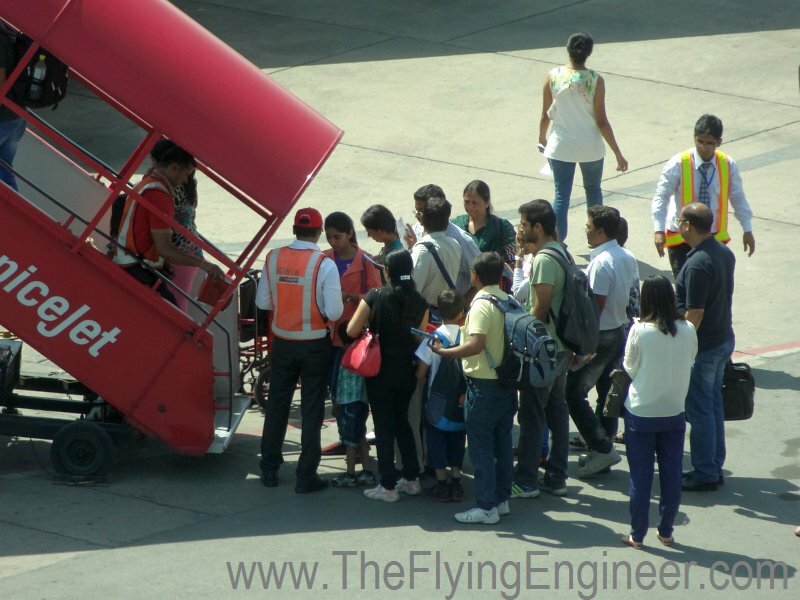 The Flying Engineer interacted with the head of the Indian presence of a leading global computer brand, and he was disgusted with the service on board, vowing never again to travel, or make his employees travel by the airline. The service he complained about was both on-board and at the terminal. On board food had touched its worst. “Hot meals” and “hot food” were hot versions of stale food. The food at many times was reportedly not palatable, and on atleast one occasion, a passenger suffered from food poisoning after consuming the on-board food. 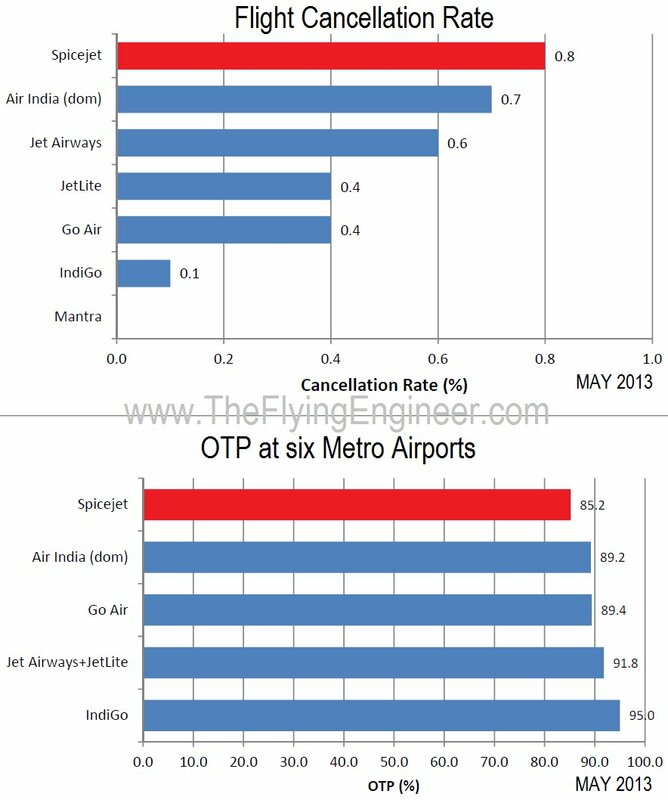 Last year, statistics published by the DGCA showed SpiceJet had the worst on time performance, and the highest number of flight cancellations during May. This made a passenger, especially the business traveller, look upon SpiceJet unfavourably. Nobody would like to be late for business, or not reach the intended place at all. The in-flight experience and the poor on time performance and cancellation rate had damaged SpiceJet’s brand, making it the least preferred of all carriers in FY2013-14, explaining in part the low load factors. 1.a.ii Insufficient Direct flights, connections, Frequency & Timings. IndiGo flies more flights (larger choice of timings) per route than SpiceJet, opening up more options and more reasons for a customer to choose IndiGo. 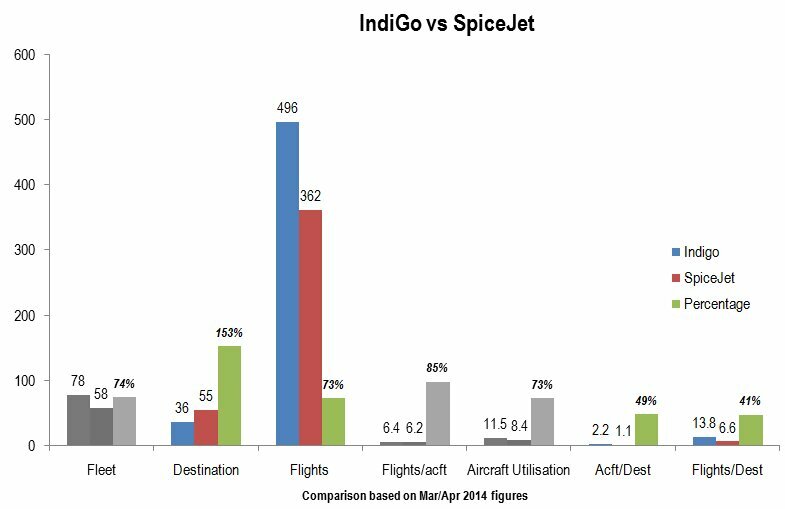 Based on data available in March-April 2014, SpiceJet had an average of 6 flights per destination, while IndiGo had close to 14 flights per destination-more than double the frequency. This also meant that the probability of a passenger having a favourable (low layover time) connecting flight with IndiGo was much higher than SpiceJet’s, implying that a passenger may have in most cases prefered an all IndiGo connection, or an IndiGo+SpiceJet connection as opposed to an all Spicejet connection, helping SpiceJet feed traffic to IndiGo’s routes. For example, for a Bangalore-Lucknow flight, IndiGo offers a direct connection of 2hr25min as well as 15 options with one stop. However, SpiceJet has only one flight to Lucknow, with one stop (no direct flight), and the total duration of the travel is 10hr35min, which includes a 6hr40min layover at Delhi. However, IndiGo has connecting flights with a travel duration of as low as 4hr35min. Even worse is the fact that the total trip fare on SpiceJet is higher than six of those options, for a random sample. For another sample, on the same route, the results (price + trip duration) were again in favour of IndiGo. The numerous favourable options from IndiGo are not solely because of the airline’s large fleet. 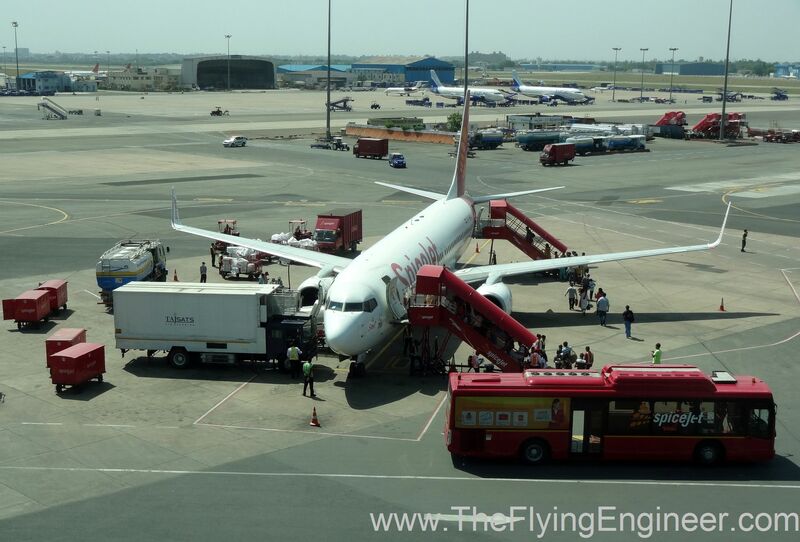 SpiceJet’s network is spread out, and the fleet is put to use in covering more destinations. IndiGo on the other hand focuses on lesser destinations, which as a result leads to a higher frequency on its money making routes, allowing it to grab a larger share of the market, and offer more options for the traveller. Based on March/April 2014 figures, SpiceJet had 20 airplanes lesser than IndiGo’s, but almost 20 destinations more than IndiGo’s. This gave SpiceJet reach, but its reach was not adequately supported by its frequencies. 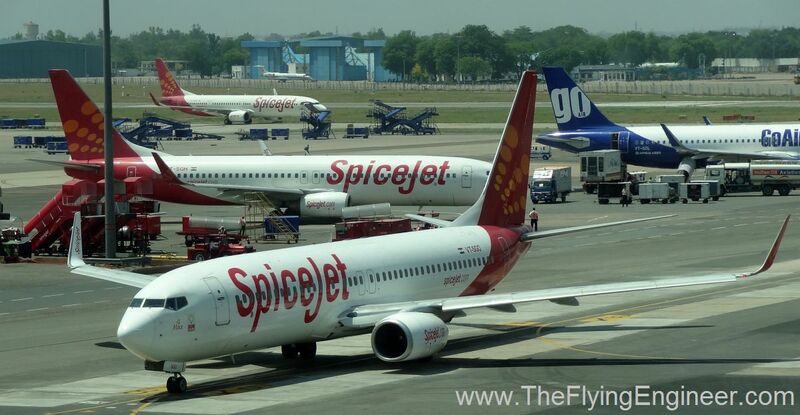 Further, SpiceJet adopted the hub and spoke model to a large degree, while IndiGo offered (and offers) more of a point-to-point connectivity. Tier II cities of economic importance are directly connected to the state capital, while SpiceJet routes the traffic via a hub, which only reduced the appeal (through longer travel time) for the passenger. With these, IndiGo emerged as the preferred airline, while SpiceJet became more of a tourist airline. Average yield per passenger for the airline in FY2013-14 was INR 4,999. If the average load factors in SpiceJet were 75%, or 2.8% more than the average in FY13-14, the airline may have realised an additional operating revenue of INR 244 Crore more than the 6,304 Crore it made last financial year. Flying more passengers burns more fuel, and the fuel bill would have risen by just ~INR 33 Crore, resulting in a profit of INR 211Cr. Realistically speaking, the profit may have been higher, due to non-linear pricing as the travel date approaches and seats get filled up. 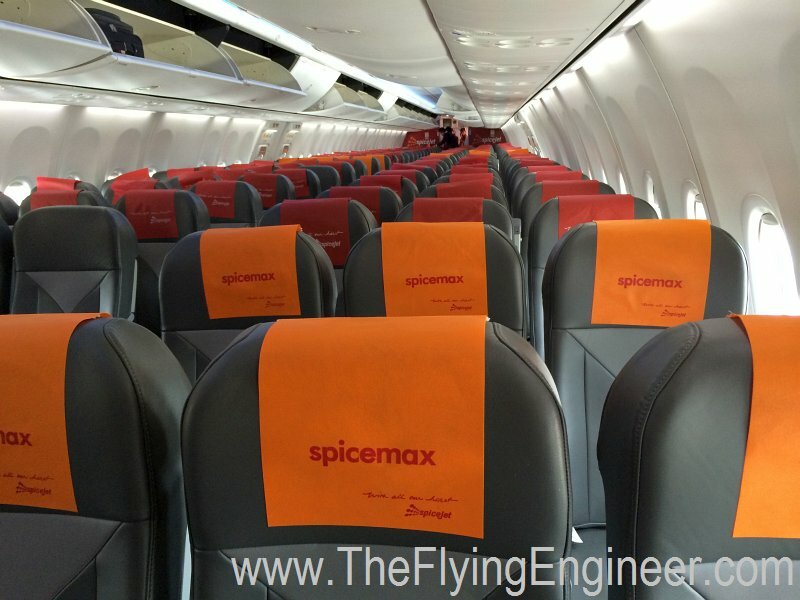 One argument that may be put forth is the fact that SpiceJet’s workhorse, the 737-800, had 189 seats (We say ‘had’, as their 737-800s are being laid out with 186 seats). 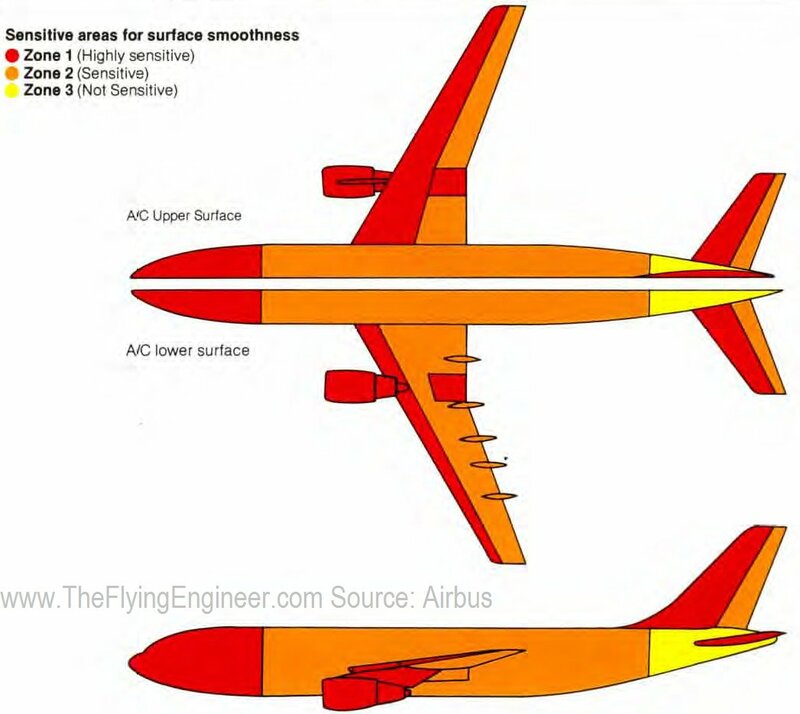 72% load factor on a 189 seat aircraft is 136 seats, which translates to 75.6% on the Airbus A320. However, there are two points here. One is that the airline’s fleet consists of aircraft with three different capacities: 189 seats (Boeing 737-800), 212 seats (Boeing 737-900ER), 78 seats (Q400), which result in a fleet-size-weighted average of 163 seats per airplane. Secondly, as per a senior airline official, the Q400s fly with load factors of 80%, which only mean that the Boeings’ load factors were below 72%. These two factors point to the fact that the Boeing fleet weren’t flying, on average, with as many filled seats as IndiGo’s. IndiGo’s average load factor for FY2013-14 was 76.7% for domestic, and 81.6% for international. 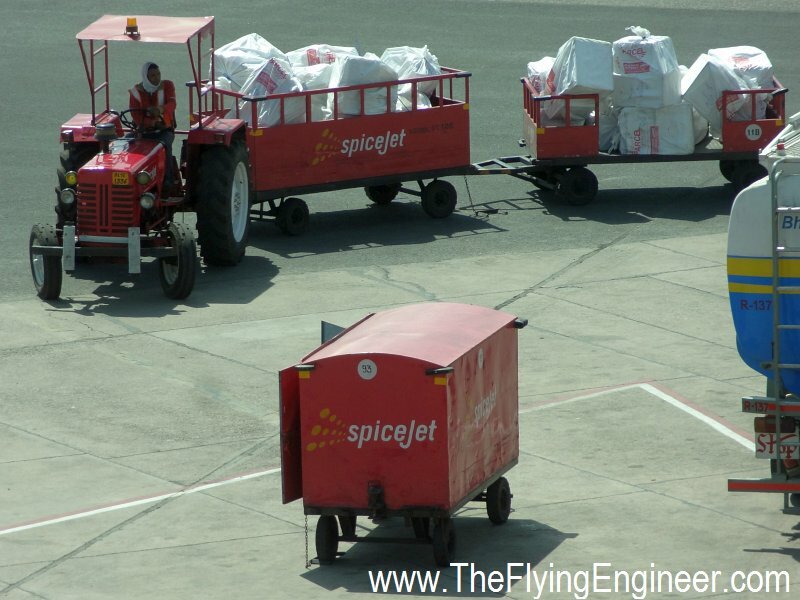 In the year FY2012-13, SpiceJet carried 65,690 tonnes of cargo (freight). The revenues realised out of this was INR 150 Crore. This translates to INR 22,850 per tonne. One tonne is equivalent to 10 passengers. Although 10 passengers yielded (in that FY) on average INR 45,000-double the revenue for the weight equivalent of cargo-cargo still supplements income. In FY2013-14, SpiceJet carried an average of 685Kg of freight per flight. This is close to IndiGo’s which carried on average 643Kg of freight per flight. However, this is close to half of what GoAir Carries: more than a tonne of cargo per flight, along with its good passenger loads. GoAir’s average load factor was 74.2% in FY2013-14. With GoAir flying nearly twice the cargo of IndiGo or SpiceJet, the airline flew with 600Kg greater cargo than its competitors, which revenue wise, is equivalent to 3 passengers. This effectively raises GoAir’s average passenger load factor to 75.8% with an assumption of just 600kg of freight. If SpiceJet were to have carried on average 115Kg more, per flight (the presence of the Q400 in the fleet complicates calculations), the airline could have generated an additional revenue of INR 30 Crores, with minimal impact on the fuel bill. While load factors and cargo bring in money, operations burn money, and how efficient an airline’s operations are, determine how low the costs can be kept. Operations include aircraft utilization, and maintenance. SpiceJet’s aircraft fly for an average 8.5hrs/day**. In comparison, IndiGo flies its aircraft on average for 11.5hrs/day, whereas GoAir flies its airplanes for an average of close to 12.5hrs/day (all based on March 2014 figures). Utilising the airplane longer, per day, spreads the lease cost over that many hours, with only a slight increase in operating costs, effectively reducing the cost per seat kilometre. IndiGo may need not fly its airplanes as hard as GoAir’s, as it enjoys great airplane purchase and lease deals, due to its scale of orders. But SpiceJet, which neither has great orders to lower its airplane costs (even in the form of rentals), nor high aircraft utilisations to spread its cost, is asking for losses. Contributory factors to the poor utilisation are planning, aircraft*, and turnaround times. IndiGo targets, on average, a turnaround time of 30 minutes, while SpiceJet targets 40 minutes – 10 minutes higher. With an average of 6 flights per aircraft per day at Spicejet, 10 minutes translates to one hour saved: an hour that can be utilised in flying a additional revenue flight. A lower turnaround time also allows a set of flight crew to operate more flights per day, for almost the same remuneration. One SpiceJet pilot stated, “Yes, our aircraft have a low utilisation. What is the point in flying another flight when there is no demand?” That is not a very right statement. That argument is nullified by the fact that the other airlines- IndiGo and Go Air- operate extra flights, and report profits. SpiceJet’s average daily aircraft utilisation was, on average, 3 hours lower that of IndiGo’s. 3 hours can accomodate another Bangalore-Delhi flight, or another Mumbai-Delhi flight, both of which are high load sectors. Pushing the aircraft to fly one additional flight per day also has the effect of capturing more of the market, and bringing in more revenue, as discussed under 1.b. Operating revenue was INR 6,304.23 Crore in FY13-14, with a total of 18,494 Million available seat kilometres (ASK), with an average of 8.5hrs/acft/day. If this number were to be bumped up to 11.5hrs/acft/day, and assuming the ASK rose proportionally, the available ASK may have jumped to 25,000 M seat kilometers, and the revenue, assuming similar yields and load factors, would have touched INR 8,600 Crore: which is INR 2,243 Crore more than what the airline made. The net gain, after accounting for certain increased costs, as shown in the table on the side, would have been INR 495 Cr. Ideally, SpiceJet should be pushing its airplanes as hard as Go Air’s. **Please refer the airline’s comment’s on the utilization. Actual utilization figures and differences are explained by the management at the end of this article. How well you take care of your asset determines how well it takes care of you. And that image spills to the customers, who decide whether to trust their buck with the magnificent men and their flying machines. Dirty aircraft have two effects: They increase fuel burn, and they lower passenger appeal. Dirty aircraft imply insufficient aircraft upkeep beyond the necessary, and also point toward a higher possibility of poor airframe condition: excessive gap tolerances, badly fitting hatches and covers, fairing deterioration, and incomplete retraction of moving surfaces. 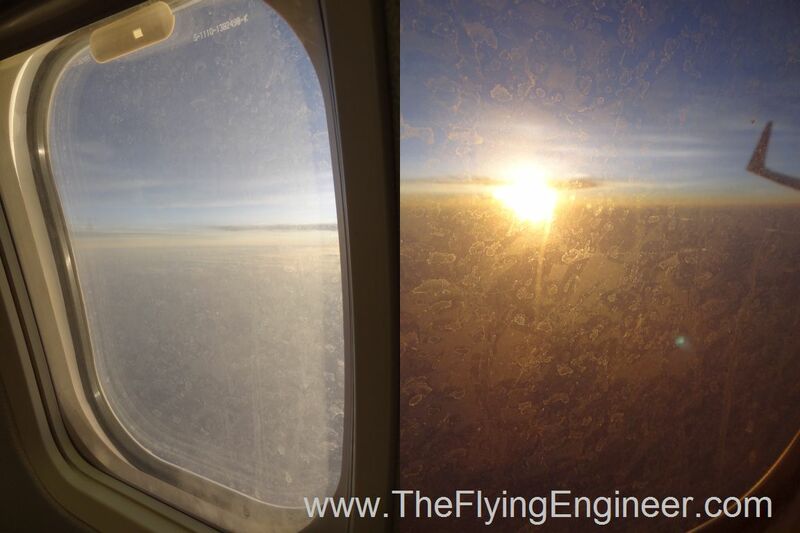 Dirty aircraft can result in up to 1% extra fuel consumption. Considering a mere 0.1% penalty, keeping SpiceJet’s aircraft clean in FY2013-14 could have saved the airline as much as INR 8 Crore in fuel expense. Which is why IndiGo keeps its airplanes so clean. Maintenance cost at SpiceJet shot up steeply in FY13-14. The dollar, which was, on average, in FY2013-14 34% stronger than in FY2012-13, does not take the full onus of the rise in maintenance cost per aircraft in FY13-14 to three fold of that in FY12-13. 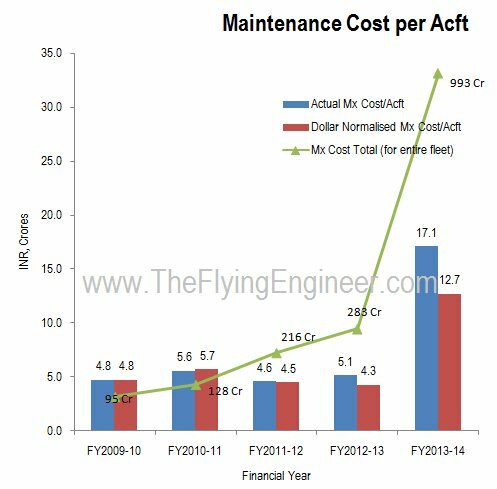 After normalising the maintenance costs for the dollar, the average maintenance cost per aircraft per year stood at an average of INR 5 Crore for four years starting with FY09-10. However, in FY13-14, the cost stood at INR 17 Crore per aircraft per year, while with the dollar rise, and based on previous year costs, the cost should have touched close to INR 7 Crore per aircraft per year. FY13-14 was the first financial year to witness all 15 Q400s operating in the airline’s fleet. Contributory factors to the high maintenance cost are the age of the aircraft in its fleet, and the reportedly shockingly high cost of maintenance of the Q400. IndiGo operates a single aircraft fleet, and most of its lease agreements are for a period of six years: long enough to fly a new airplane and avoid an expensive maintenance check known as the “D” check (technically, C6 or P8 check), which usually happens in the 7th year, for airplanes like the A320 and Boeing 737NG. Further, all of IndiGo’s airplanes are new, which qualifies the operator for certain manufacturer warranties and benefits which help offset initial maintenance costs. 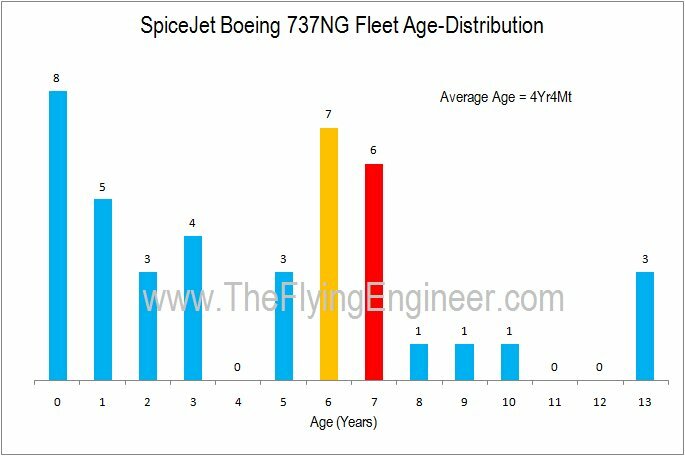 In FY13-14, almost 30% of the Boeing 737s in the fleet were seven years or older, and half of those (six aircraft) had touched seven years of age: the age around which the expensive heavy maintenance check is due. The expense form this heavy maintenance of six aircraft explains the apparent increase in the maintenance cost per aircraft. This year, seven aircraft will turn seven years old, which will again prove costly for the airline’s maintenance. Had the airline not opted for the Q400, and kept the lease contracts within six years, like what IndiGo does, the airline would have had a maintenance bill of only INR 406 Crores, with the dollar effect factored in, as opposed to 993.25 Crore that the airline spent on maintenance. The airline could have saved INR 580Cr, just by avoiding those D checks. Certain costs are beyond operations, but impact the net profit and loss of the airline. SpiceJet, unlike AirAsia, gives its agents a commission, which typically amounts to around 3.5% of the revenue from operations. 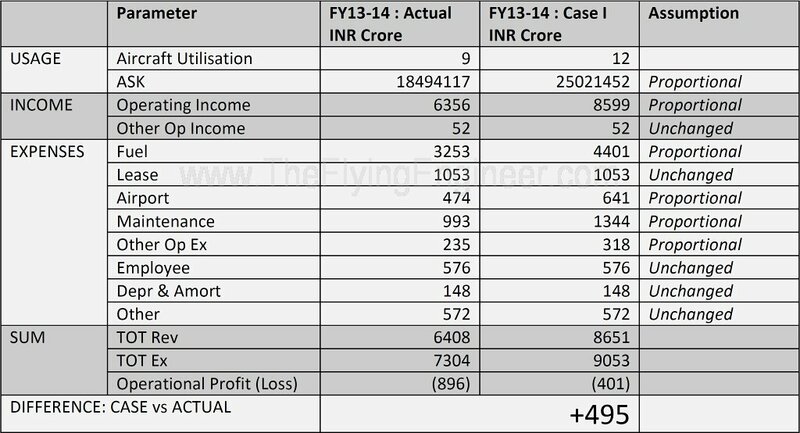 In FY13-14, SpiceJet paid an estimated INR 200 Crore to its agents, which, if not given, could have helped lower the fares by an average of INR 175 per ticket, or could have helped the airline save INR 200 Crore. 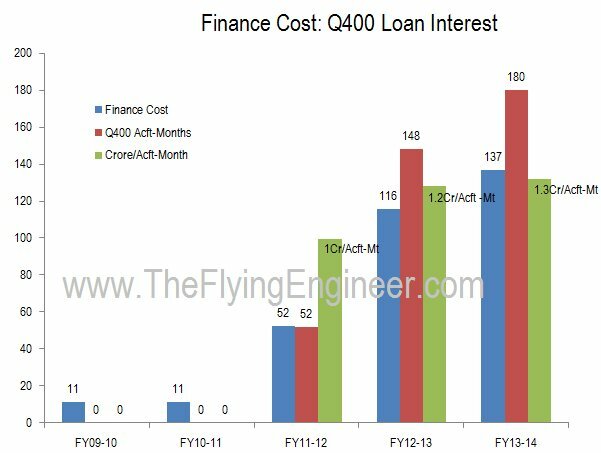 SpiceJet has loans, and those on the books are for the Q400. Finance costs, which is largely made up of interest on loans, rose to INR 136 Crore in FY13-14 from INR 116 Crore in FY12-13. In FY2011-12, the airline received eight Q400s, and in FY2012-13, the airline received seven Q400s. Interestingly, each financial year was burdened with an equal amount of 52-aircraft months (sum of the product of each aircraft times the months of interest applicable that financial year) equivalent interest for the new aircraft. Assuming that the interest on the loans is at a flat rate, the increase in finance cost is in perfect sync with the average depreciation of the Indian rupee against the dollar, year on year. 4. Aircraft: An airline’s second most important asset. The choice of aircraft is very important, and so is the mix of the aircraft fleet. Having one type of aircraft, and even just one variant of aircraft, is the norm for some of the most successful low cost carriers world over, like Ryanair, AirAsia, and Southwest (which recently broke that trend to induct 737-800s for international operations). However, a clever mix of aircraft types can yield the airline better results than a single type. That requires a good study, prudence, non-emotional driven decisions and due diligence on the airline’s part. JetBlue (A320+E190), WestJet (B736,737,738+Q400) and Nok Air (B738+ATR72) are fine examples of profitable airlines with a dual fleet type. The Boeing 737-800 is one of only two widely popular airplanes of choice, the world over, for a low cost carrier, the other being the Airbus A320-200. Newer Boeing 737-800 airplanes are good for the airline on two levels: passenger appeal, and performance (fuel burn) improvement. 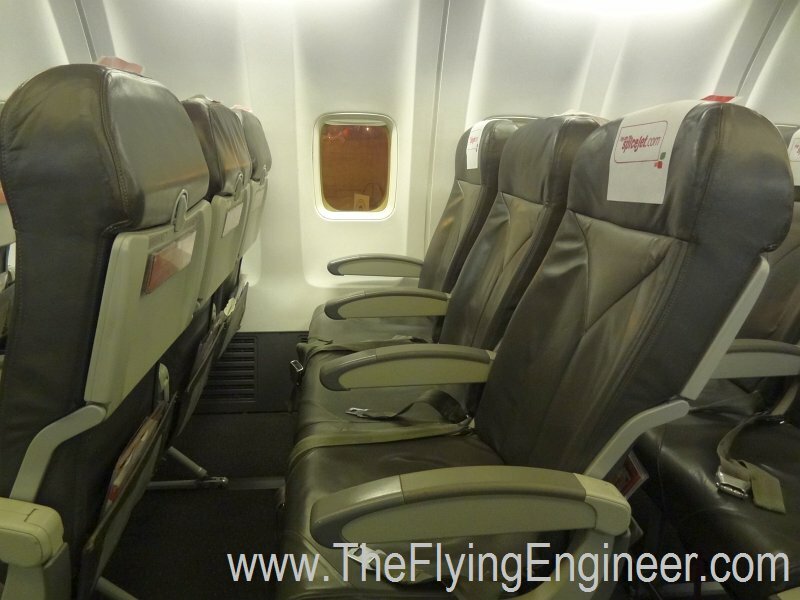 The newer Boeing 737s in the fleet, and all new ones henceforth, have the cabin fitted with the Boeing sky interior. The sky interior greatly and positively impacts cabin appeal, and awards a classy feel to the interiors. This can go a long way in impressing the passenger. Deliveries of sky-interior equipped Boeing 737s began in late 2010, and the airline had 11 sky interior aircraft in FY13-14. July 2011 onward, Boeing 737NGs are delivered with the CFM56-7BE engines (note the difference between engines with the image on the left: The one with the apparently shorter nozzle is the newer 7BE), which offer fuel saving over older CFM engines through an improved design that includes high and low pressure turbine modification. This is part of the performance improvement package (PIP), which Boeing introduced, which includes aerodynamic modifications to help reduce drag. The PIP modification, standard on new 737NGs, introduces a two percent fuel saving. This translates to a INR 1.3 Crore per aircraft fuel saved, per year, with an assumption that a Boeing 737-800 with the PIP is flown on the equivalent of 4 Bangalore-Delhi flights for 365 days. Had all the Boeing 737s in SpiceJet’s fleet (23 of which are old and not with the PIP) been the new airplanes with the PIP, the airline could have saved ~INR 30 Crore in fuel bills, with the minimum estimated at INR 20 Crores. When Bombardier sold the Q400 to SpiceJet, everyone believed, and was led to believe that the aircraft will do good for the airline. WestJet and other airplanes have put the airplane to good use, but SpiceJet could not replicate that success. For one, the Q400 is not topicalised to the region. The temperatures and conditions in India are high enough to cause numerous failures, including early windshield cracks. Initially, the airline had issues with the APU during the summers. That was resolved, only to an extent, by modifying operating procedures. The Engine Driven Pump (EDP), which pressurizes the hydraulic system, has serious issues which impact dispatch reliability. Apparently, Bombardier’s support has also been an issue. Spare part availability is a problem, which resulted in a grounded Q400 (due to a bird hit) taking longer than usual to re-enter line service. Due to significant maintenance problems with the Q400-an issue that many Q400 operators have complained of-the airline does not, and possibly cannot utilise the aircraft as much as it may wish to. Sanjiv Kapoor, CEO of SpiceJet who officially is the COO, mentioned to The Flying Engineer that the aircraft cannot be pushed as hard as the airline wishes, because the airplane needs a “cooling period” between flights. This results in the second issue. The Q400’s only competitor is the ATR72. The ATR72 flies slower, but lands up consuming around 20-30% less fuel than the Q400, for the same flight. The only way the Q400 could have been economically as competitive as the ATR72 was to fly atleast an additional sector due to its speed, thereby spreading the costs over many more flights. But unfortunately, such is not the case. The one and only advantage of the Q400 over the ATR72- speed: suiting it for more range, upto 100-150NM more, and allowing for greater flights per day-are lost. The Q400 costs higher than the ATR72 to buy, costs a lot more to operate, and has an hourly maintenance cost that is disproportionate to the size of the airplane. Even worse? The Q400 is not as popular in the global market, which didn’t offer SpiceJet an opportunity to lease the aircraft. Most established lessors keep away from the Q400. This has put SpiceJet in tight spot. Had the airplane been leased, SpiceJet could have at worst paid a penalty, terminated the lease, and put the airline on a turnaround fast-track. These fifteen aircraft were apparently bought, according to Sanjiv, “as the airplane made sense back then, when fuel prices were lower”. But there is strong reason to believe that the choice of the airplane was anything but scientific. Had SpiceJet gone in for the ATR72s, it would have been happier, and wealthier, with the slower but far more economical and reliable turboprop. The airline wouldn’t have even faced problems with flight crew: pilots from Jet Airways and the now defunct Kingfisher airlines would have significantly reduced the dependency on expat pilots who can be as expensive as two and a half Indian captains. Type examiners, instructors, check pilots, line captains, maintenance engineers-all could have been Indians, with minimal financial burden due to training. Sanjiv Kapoor openly stated his preference for a single fleet, and added that the Q400, in light of the fuel and maintenance costs, “isn’t as relevant today”. People are an airline’s most valuable asset, and sometimes, the biggest liability. The airline has 5,200 employees. SpiceJet employees are paid lesser than those at IndiGo, reportedly INR 1,15,000 lesser, per month, for captains. The airline has acknowledged this, and pilots have a way of showing their resentment. One captain has mentioned to The Flying Engineer that the flight crew sometimes extend flaps and landing gear early, and resort to other high fuel burning practices, such as an unnecessary deployment of thrust reversers upon landing, in the feigned “interest of safety”, just to show the airline that if the salaries aren’t upto the industry rates (defined by the highest paying airline in that category), then the airline will have to pay, one way or another. If everyday, a captain manages to burn off close to 100kg extra fuel per day (some claim to burn a lot more than that), then that’s a direct loss of approximately INR 9,000, which translates to almost INR 1,50,000 per month, per captain, assuming he flies 4 days a week. Rephrasing the sentence: if a captain was not motivated to work towards saving even around 50kg of fuel per flight, then the airline may have lost more than INR 55 Crore in one year, which could have otherwise been credited as salaries. Developing a sense of ownership is somehow and sometimes a cultural challenge in India. Some employees are led to believe that they are above applicable rules, and, as an example, do not wear ramp jackets on the apron (see image on left – top: captain interacting with ground crew after having completed his walk around, bottom: crew walking away from the aircraft after a flight), although their first officers, and everyone else around do so, diligently. These small incidents are reflective of the person’s approach and attitude. The Verdict: Could FY2013-14 have been profitable or not? Will it survive? The answer? Yes. The airline could have reported a profit of ~INR 550Cr, or reported a small loss, of not a break even. This math does not consider many other areas where money could be saved, including the potential savings associated with an ATR72 fleet, or the savings associated with motivated pilots working to save money. Low loads, low utilisation, maintenance, and agent commission have a large impact on the airline’s P&L. But we’ve got to be honest. Quite a few of the assumptions here are assumptions, and some may not be easy to implement, such as re-writing lease contracts overnight. But what this entire exercise shows is that there are numerous areas for improvement, all of which are achievable. In fact, almost all the areas we’ve touched upon here are areas which IndiGo has already mastered, bettered, or simply implemented. If IndiGo can do it, so can SpiceJet, provided the far-sightedness, discipline, and planning are similar. The only difference between IndiGo and SpiceJet? The former got its basics right, right from the start. The latter is responsible for the mess it is in, and the dollar rates and market conditions are only a small part (and an excuse) of the bigger story of loss. The onus is now upon a new management to turn around an airline, which isn’t the easiest thing to do. The only concern on the minds of most is if for any reason the transformation doesn’t happen as fast or as effectively as expected, the slew of competitors- Air Asia India and TATA-SIA may sandwich, and strangle the airline. Why? Because SpiceJet is positioning its product between AirAsia’s and TATA-SIA’s offering. SpiceJet now has good legroom seats, and a few other services which make it part-full-service, should a passenger choose to pay for those. However, it may be unlikely that it may match the premium image of TATA-SIA. 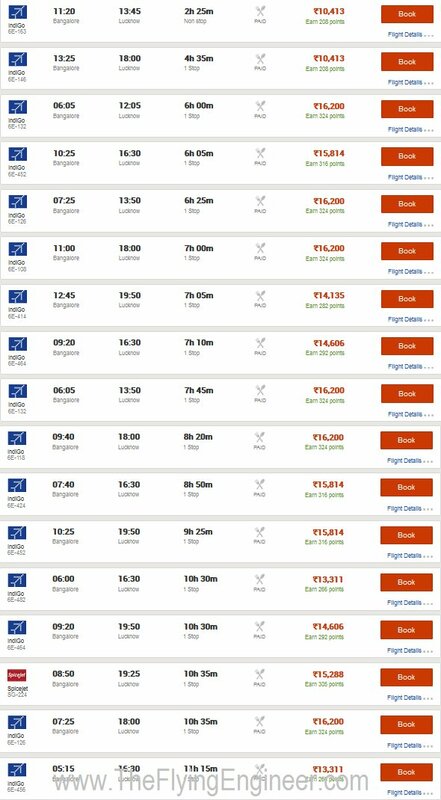 On the other hand, the airline has pretty much become an AirAsia to fight AirAsia, but has also made it clear not to bring its fares too low to play the AirAsia game: something that IndiGo can, and has, but SpiceJet may not. Whether this uniquely positions SpiceJet to its advantage or disadvantage will be answered in the face of the dynamics of the market, and over due course in time. The all new SpiceJet: What the airline is doing. An airline is a service industry, which is defined by the service. Service includes on time performance, in flight experience, and the experience on ground. Ever since Sanjiv Kapoor stepped on board, which was in November 2013, he and his team have been working diligently towards an image makeover. The first thing he targeted was on time performance, which SpiceJet was not known for. The result? For the three months December, January and February, SpiceJet topped the on time performance charts: from lagging to leading. “Being #1 on-time for the third month in a row is the result of constant focus of all departments across the company on on-time performance, where every delay, even if only for one minute, is tracked, and root causes investigated and reported internally”, said the upbeat CEO in March. Said Mr. Kaneswaran Avili, Chief Commercial Officer, SpiceJet, on May 5th, 2014, when the airline introduced the ‘On Time Guarantee Program’ for passengers, ”We have delivered a significant improvement in our OTP over the last few months. This is the result of SpiceJet’s renewed focus on delivering superior customer experience, based on the principle of SOCCH: Safe, On-time, Clean, Courteous and Hassle-free”. Under the program, the airline will compensate the passengers in case of a flight delay and cancellation due to reasons under its control. The airline also changed its slogan, from “Flying for Everyone”, to ” With all our heart”, signifying a shift in focus from being an affordable airline to a service-oriented airline. The airline has instructed its cabin crew to be as warm as possible, and as a result, cold smiles and disconnected service are almost a thing of the past. The airline has introduced boarding music, and significant attempt is being made to keep the cabins and exterior as clean as possible. However, what the feel that a Sky Interior provides cannot be matched by the older, and sadly dirty aircraft. Of the 37 operational Boeing 737s, twelve have the sky interior. 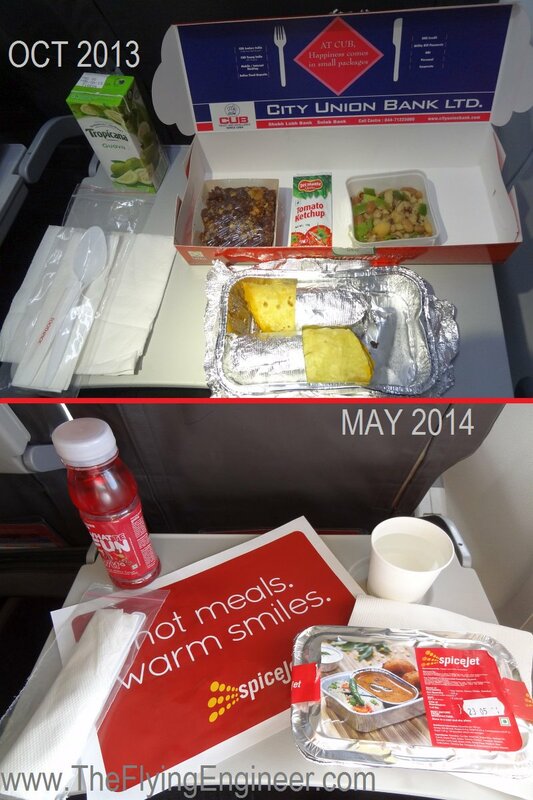 The airline has introduced a variety of hot meals, in partnership with Cafe Coffee Day (CCD) and TAJ-SATS. 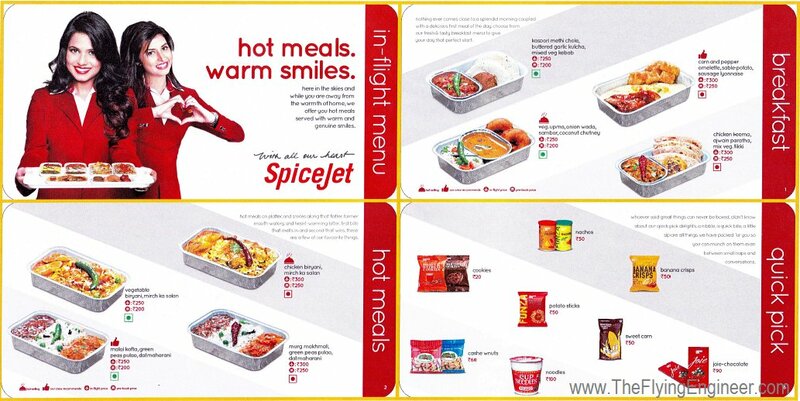 The new hot meals are far superior to the old offering, bringing SpiceJet’s service and in-flight offering to a level among LCCs, matched only recently by AirAsia India. Significant focus is on the corporate traveller. 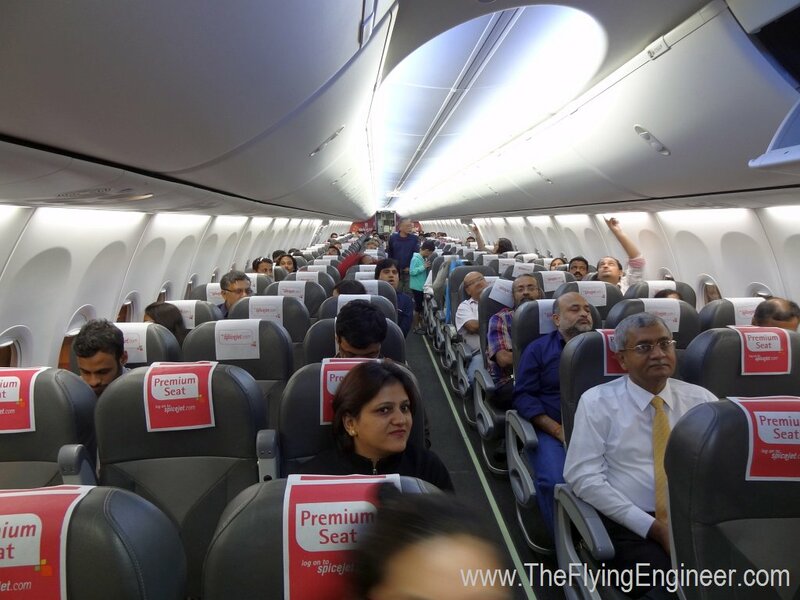 SpiceJet has five dedicated rows of seats-the first five in the cabin on the Boeings, which feature a luxurious 35-36 inch legroom: 6 inches more than the 29 inches found elsewhere. The airline has achieved this by knocking off a row of seats from the right side of the cabin. What this means to a corporate traveler is comfort, and the ability to comfortably work on his or her laptop. With 29 inches, working on a 15″ laptop is almost impossible. SpiceJet as an airline is also talking to corporates, to bring them back to an airline with better OTP and service. With AirAsia India perceived a threat, the airline has made all efforts to make SpiceJet another AirAsia: weekend uniforms, boarding music, hot meals, and more-all inspired by the AirAsia group, which the airline studied, to introduce before AirAsia India did. Today, SpiceJet has a product offering that stands out from other low cost carriers: 30 seats with unmatched legroom. Add to that the optional hot meals, warm staff, better service and the airline’s determination to maintain a good on time performance and reduce cancellations: It’s an airline that isn’t targeting flying for everyone, but carving a nice for itself by positioning the product between a low cost offering and a premium full service carrier. Today, IndiGo is the preferred airline for corporate travellers; SpiceJet is trying to change that. It doesn’t have the size and network to fight off IndiGo, but has value added service and comfort to compensate. It’s not just the paying customer, but its own employees that SpiceJet seems to be lending a big ear to. Having realised the importance of its staff and crew, SpiceJet is finding ways to retain its technical workforce. With uncertainty looming about the airline’s future, compounded by the then low salaries, many crew have already jumped ship to other, seemingly more stable carriers. A SpiceJet captain’s monthly salary, which was reportedly INR 1,15,000 lower than what IndiGo offered, has been upward revised by INR 95,000, now trailing IndiGo’s by just INR 20,000. Said a senior first officer at the airline, “He (Sanjiv) has no choice. Else everyone will leave”. Not only is the upward revision good to retain staff, it may help cool off those who may like to display their aggression through burning more fuel. SpiceJet is also looking at streamlining crew rostering, which can help it offset the costs associated with higher crew salaries. 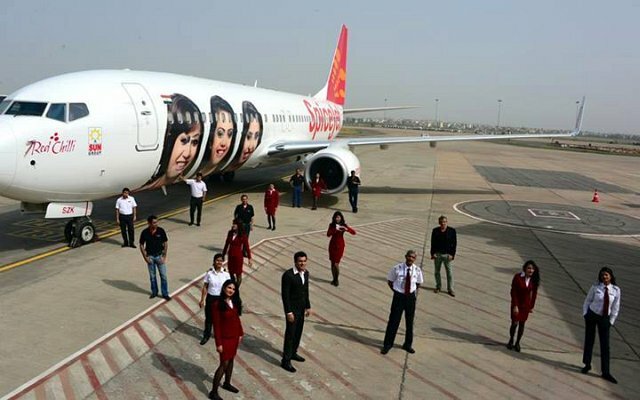 The airline has discarded models, and uses its staff as its ambassadors, in advertisements, and most recently-their photos stickered (in large) on the fuselage of the airplane, becoming the first airline in India to do such a thing. Those employees who become the public faces of the company do get a boost, and does have the effect of inducing a positive feeling of ownership in the airline. How does the airline benefit? Improved employee morale, and a one year contract between the airline and the ambassadors during which the staff cannot leave the airline. With such unique aircraft, the airline engages with the public through contests which require them to capture photos of the aircraft, at avrious airport and off-airport locations. This also gives the airline branding without any real cost to the company. Sanjiv has also taken crew abuse seriously, and has in more than one occasion come to the rescue of his crew when passengers crossed the acceptable line of behaviour. He also frequently writes to his employees, keeping them abreast of the developments in the airline. An aircraft maintenance engineer, formerly with Jet Airways, and now with SpiceJet, appreciates the gesture. : “I feel connected. I know what’s going on. I don;t feel like I’m in the dark about the airline”. The airline, at the start of the calendar year, had 43 Boeing 737s, which has now reduced to 37 operational Boeing 737s. Six aircraft are being returned, of which 2 were scheduled and four early returns. The airplanes being returned are the older 737s, and this is part of the airline’s turnaround plan: to shrink, restructure, rework and rationalise the routes, and then re-expand. International destinations have reduced from 10 to seven. The airline has four years between today and the delivery of the Boeing 737 Max aircraft, 42 of which were ordered during the 4th edition of India Aviation at Hyderabad, in March 2014. Sadly, its the Q400 that the airline has a hard time with, and unlike the 737s, is not leased, making it difficult for the airline to dispose off the costly, underutilised turboprop. A big change has also been effected at the management level. Quite a few top level management staff have been replaced. An asset for the airline is Kaneshwaran Avili, who was with AirAsia during its inception, and later with Tiger Airways, before moving to SpiceJet. Avili has seen the Indian reality, realising that some of his time tested methods do not work in India; not yet atleast. However, he brings with him the ability to think on the lines of AirAsia, giving SpiceJet a good chance of surviving even with the newest and publicly the most aggressive airline in the Indian airspace. Another change is the drive to reduce agent commission. Kaneshwaran Avili told The Flying Engineer that travel agents actually benefit from a lower commission, as it results in low margin but high volumes. According to Avili, travel agents in Thailand who agreed to this lower commission are some of the biggest today. Ancillary revenue accounts for a meager 8% of revenues in India, while it is as high as 26% overseas, because of the distribution model in the country. The airline has been pushing for ancillaries to be offered as an option on online portals. Since only 15-20% of the bookings are through SpiceJet’s website which display meal, seat and baggage choices to passengers, the remainder 85-80% of bookings are through online portals and agents who focus on other airlines as well, and don’t yet focus on ancillaries. The low fare Rupee 1 sale in early April, just after Avili joined the airline, made headlines, with good and bad results. The DGCA came down hard on the airline, only to later allow AirAsia and IndiGo to launch the Re 5 and 1 fares, respectively. Since then, SpiceJet has been offering a lot of promotional airfares. The logic is quite simple: if based on statistical data, the airline is not confident of selling a percentage of seats, it would rather give away those seats at promotional fares, like 1,899. Does it work? This has apparently stimulated the market sufficiently. Airline bookings have reportedly gone up, even for fares that are not promo. When a family travels, some fares may be available as promo, while few may be regular. Overall, the family saves money, but had the effect of making the family decide to fly with SpiceJet, giving the airline a few regular ticket sales. Secondly, during a promo, people grab seats, and later realize that they may not be able to travel on that date. That may force many to re-book, and that gives the airline money. Third, and most importantly, the airline is witnessing first time SpiceJet flyers, who become repeat customers. Promo fare sis a way of giving people a second chance at SpiceJet, to experience the all new airline, with the hope of erasing notions from past experiences. To many, the experience positively transforms their image of the airline, and that only means more passengers choosing the airline. With the 1,899 all inclusive promo fares, the airline makes approximately INR 1,500. On a sector as long as Bangalore-Delhi (and the longest on SpiceJet’s route), every 10 passengers contribute to a fuel burn increase of as much as 120Kgs. 120Kgs with Bangalore’s aviation turbine fuel rates costs INR 11,300. 11,300, when spread across 10 passengers allows the airline to make INR 370 per passenger, or INR 3,700 for ten passengers. On shorter sectors, the airline makes more money from each passenger. The other cost of operations are paid for by other passengers who pay regular airfares. Even a meager 3,700 over 360 flights per day over a year translates to close to INR 50 Crores. The airline is switching to a new revenue management software which is apparently cheaper to use and far more responsive to a dynamic market. It’s simple. Everyone admires IndiGo, and so do Sanjiv Kapoor and Mittu Chandilya. IndiGo’s profits are expected to have taken a hit, but a profit is a profit and not a loss. If IndiGo can do it, so can SpiceJet. The airline has been herded by far too many people along too many paths, and that has resulted in quite a mess: something that Sanjiv and his team of able men are hopefully undoing effectively and quickly. With competition intensifying, the airline does not have the luxury of time for a long drawn turnaround. SpiceJet today aims at being better than IndiGo in terms of value added services tailored for the corporate traveller. With its 36″ legroom on 30 of its seats, SpiceJet today has an in-flight product that cannot, and will not be matched by IndiGo and AirAsia: these two airlines know their place in the market. TATA-SIA will be the only threat for SpiceJet. In essence, 17% of the airline’s Boeing capacity will compete with TATA-SIA, and 83% will compete with IndiGo and AirAsia India. 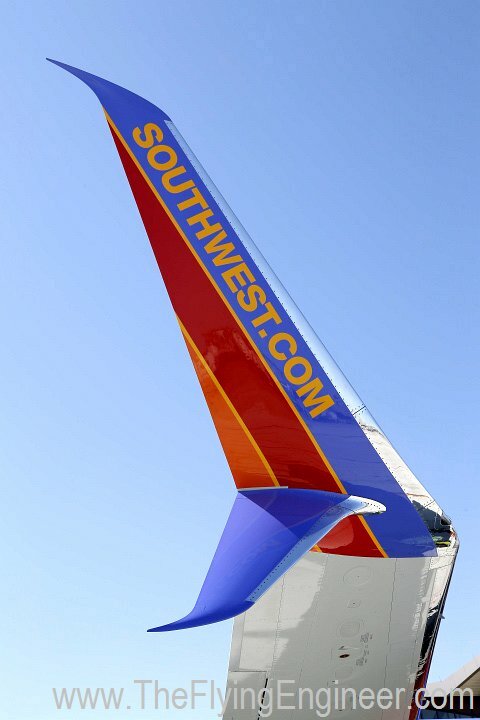 More than establishing its new brand identity, the airline needs to undo the damage from its previous image. The airline has underutilized its marketing and branding budget in FY13-14; FY14-15 should see a strong marketing campaign that will help SpiceJet reap rich dividends. The airline must place more emphasis on its sky interior during its marketing campaign, must consider changing the color of the seat-belt to red (small but important), and must ensure that its on-board food, meals, beverages and drinks are consistently good. And if you really want to keep the forward cabin seated corporate traveler happy, the airline must reserve a section of the rear of the airplane for passengers with babies and kids, who more often then not get irritated-and loudly show their irritation-when traveling by air. Stronger discipline in fuel policy is possibly the need of the hour. Squeezing turn around times to 30 minutes, and smartly increasing aircraft utilisation will do the airline good. The airline must consider fitting Scimitar winglets onto its Boeing 737s, which will help the airline shave off more than 1.5% off its annual Boeing fleet’s fuel bill, or close to INR 40 Crores, while costing a little more than INR 3.3Cr a set. The airline may also want to review requests to pilots for smooth landings, as smooth landings are not always in the best interest of safety, and may times land up consuming more fuel than necessary. Efforts toward passenger appeasement must be fenced. Everything in the airline needs, or needed, an overhaul: The people, the aircraft, the routes, the fleet, and the brand image. Communication between various departments is not smooth, and bottle-necked, resulting in inefficiencies and the chance for corruption, including at the hiring levels. For the first time in years, the airline has come out with a public recruitment advertisement for trainee first officers, offering hope that the process this time around may be cleaner. Ah. SpiceJet needs a good bath, and a hot shower. After all, it’s getting classier than ever. Excellent in-depth article. Great job. Amazingly well written and researched. The author’s deep insight into the airline industry clearly shows. The report should be made compulsory reading for all MBA students. SpiceJet hopefully will turnaround because the country cannot afford to have one airline winding up after another. Wonderful and indepth analysis by the FE. Most of what you said hits the nail on the head with regards to tactical approach to get out of the red. 2. Once and alliance is formed Spicejet should concentrate on moving to a wholly hub&spoke based model with hub in Nagpur/Hyderabad. 5. Turbo-props to be deployed in metros to provide connectivity to destinations close(<~300NM) to the metros ( DEL-AGR,LKO,SLV,ATQ etc). If possible deploy Q400s only in North and North -East destinations which might have benefits of using a Q400 without penalties wrt ATR. And Buy/Lease ATRs for the West , Central , Southern regional transport. 7.Sign up code sharing agreements with european carriers that might not have enough traffic from these countries with the longer range – larger capacity routes that they have. 8. The other opportunity is from Russian /Kazakh cities to flights to warmer destinations such as the maldives,mauritius,thailand, bali and also within India to popular destinations such as Goa. Below is the 3000NM range of the 757-200 and 1500NM (practical) range of 737-800 hubbed from Nagpur. Great article. But it seems like you’ve contradicted your highly positive opinion of the Q400 in this article http://theflyingengineer.com/aircraft/proud-to-fly-a-turboprop-q400-vs-atr72/ IIRC it said that the Q400 is more efficient in the ATR72, though this one states the other way around. Sorry, I meant that the Q400 had better operating economics because its greater seating capacity and speed offsets its fuel economy. As mentioned, everyone was led to believe the promises of a Q400. What you point out to is absolutely right; however, in the light of the airline’s poor utilization of the Q400, and the Q400 giving the airline significant maintenance issues, the airline is unable to work it as hard as it is supposed to. Only when it its utilized as much as its designed to, will you reap the benefits of the speed. With its poor utilization, it economically becomes inferior to the ATR72, in the light of the reliability and the way in which it is operated, only as far as this airline is concerned.